POSTED: Mon, 09/18/2017 - 19:00 | POSTED BY: Traci C.
Each night of the party the celebration begin with A Frozen Holiday Wish with Anna, Elsa, and friends at the Castle Forecourt. At the end of the celebration, Queen Elsa transforms Cinderella Castle into an ice palace. The stage is also where party guests can check out Mickey's Most Merriest Celebration, which is a live show with Mickey Mouse and friends. 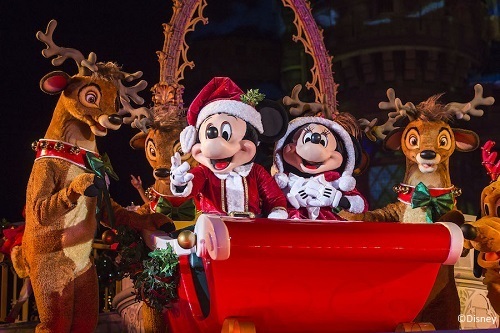 The party also includes Mickey's Once Upon a Christmastime Parade which will run twice each night. The parade features marching toy soldiers, Disney characters, and Santa. Holiday Wishes Fireworks - Celebrate the Spirit of the Season cap off the evening. Guests can also enjoy complimentary cookies and hot cocoa, plus party exclusive characters, merchandise, and food. The dates are: November 9, 10, 12, 14, 16, 17, 26 and 28; and December 1, 3, 5, 7, 8, 10, 12, 14, 15, 17, 19, 21 and 22. The parties are from 7 p.m. to midnight but party ticket holders can enter the park as early as 4 p.m.
Are you making plans to attend Mickey's Very Merry Christmas Party this year? Let us know in the comments. One of these years I'm going to get back down for this.